I died at "Ursher." These baggy britches have a name and I forget what they're called. Not MC Hammer pants... uhhh. uhhh.. shoot. AH!! Harem pants. Dat's right. 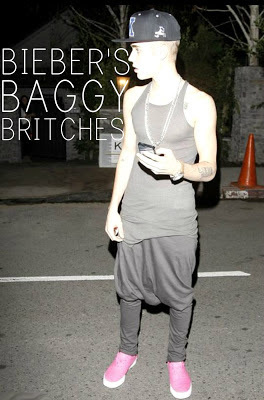 I knew they had a name, but I couldn't Google baggy pants any more to find it... the image results were causing me to lose complete faith in society. So thanks for having my back, Roo! Britches, son, you channel Beiber really well. Strangely well....yea, MC Hammer pants flared from the ankle, not the crotch. These pants are ridiculous but often times, fashion is. MC Hammer did wear this version, but there was another version that we wore in the 80's- Gaucho pants- the legs were loose and cropped? I think maybe Boy George wore them and possibly another variation by Duran Duran. Although I love new wave, I don't think it's returning. Neon sure seems to making a comeback on the soccer field these days!